I figured that one natural thing to put in the personal blog of a curious student (or a “reasoner,” which I think has a better ring) would be works, whether of the typographic era or the age of entertainment, that I find interesting and some comments from a reasoner’s point of view. This, I presume, would constitute a review. 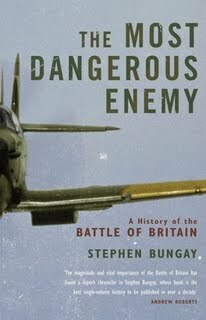 Thus, I felt it would be fitting to start my collection with The Most Dangerous Enemy: A History of the Battle of Britain (2000) by Stephen Bungay. As its subtitle states, it gives a detailed and well-researched account of the Battle of Britain, an aerial engagement in 1940 between the German Luftwaffe and the Royal Air Force (RAF) chiefly in the skies of southeast England. Bungay debunks the myth that the battle was won by “the few,” according to popular legend a handful of fighter pilots who fought against overwhelming odds and saved Britain from defeat. In reality, German defeat resulted from a wide range of factors, from the reconnaissance advantage held by the British in their invention of radar to the incompetency of the German High Command in the most critical decisions regarding which locations to bomb. As a comprehensive record, The Most Dangerous Enemy demonstrates also the Battle of Britain’s vital importance in determining the fate of Europe and the rest of the world. This book is actually a strange interest for me because I normally do not read history. Yet, the book is more than powerful enough to appeal to the curious reader. Previous Post Website and Blog Are Up!